Pragmatic Play has released its latest immersive slot, Master Chen’s Fortune™. 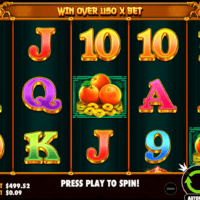 The 3×5 video slot is filled with beautifully crafted oriental symbols, many of which represent good luck, and features a brightly coloured background and immersive soundtrack, drawing the player into the world of the game. Players can win both right to left and left to right, with plenty of win lines available. If the player encounters the Maneki-neko symbol they can multiply their total bet, while the Master Chen symbol acts as the wild. Pragmatic Play’s portfolio contains more than 100 proven HTML5 video slots, including Wolf Gold and Da Vinci’s Treasure. These titles are now live with an expanding list of leading casino brands, including Rank Group, GVC Holdings and Casumo.